BimC kinesin motor domain protein supplied at higher purity and biologically active. There are approximately 50 human kinesins that are currently divided into at least 14 classes. Kinesins are involved in almost all aspects of intracellular transport and their well documented role in cell division suggests that they may be excellent targets for anti-mitotic drug discovery. All kinesin proteins contain a conserved motor domain that contains a microtubule binding site and the ATP binding / hydrolysis site. The motor domain of various kinesins have been shown to have widely differing sensitivities to ATP analogs and inhibitory compounds such as monastrol, such results lead the way to the identification of therapeutically useful kinesin specific inhibitors. Cytoskeleton, Inc. has made available a selection of recombinant human kinesin motor domain proteins from 8 of the 14 reported kinesin classes. The proteins are extensively quality controlled for purity (>85%) and biological activity (microtubule activated ATPase activity must be at least comparable to published data). The protein domains are useful as targets for anti-mitotic drug discovery and as reagents for comparative studies of kinesin class specific motor activities. Protein purity is determined by scanning densitometry of Coomassie Blue stained protein on a 12% polyacrylamide gel. All kinesin motor domains are >85% pure. See figure 1 for example purities. Figure 1. Purity of kinesin motor domain proteins. 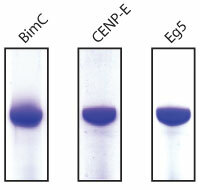 BimC (BM01), CENP-E (CP01) and Eg5 (EG01) were run on SDS-PAGE gels and stained with coomassie blue. 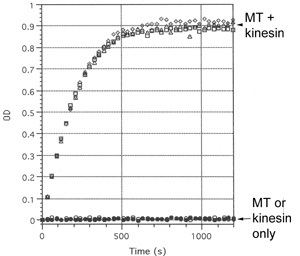 Kinesn motor activity is driven by ATP hydrolysis. All motor domain proteins therefore are tested with regards to their microtubule activated ATPase activity. Stringent quality controls that all Cytoskeleton, Inc's purified kinesin motor domains have ATPase activities comparable to published data. Figure 2. Microtubule activated kinesin ATPase assay (Cat. # BK060) using kinesin heavy chain motor domain protein (Cat. # KR01) and pre-formed microtubules (Cat. # MT001). Each condition (microtubules (MT) alone, kinesin alone and microtubules + kinesin) was performed in triplicates. Wada, Y., Hamasaki, T. and Satir, P. (2000). Evidence for a novel affinity mechanism of motor-assisted transport along microtubules. Mol. Biol. Cell 11, 161-169. Endow, S. A. and Waligora, K. W. (1998). Determinants of kinesin motor polarity. Science 281, 1200-1202. Question 1: What is the minimum concentration this kinesin motor protein can be stored at? Answer 1: For storage at -70°C, the protein concentration should not be less than 5 mg/ml. Kinesin diluted below 5 mg/ml should not be re-frozen as it will lose activity. Question 2: What is the most common use of this motor domain protein? Answer 2: The BimC motor domain protein is most commonly used in conjunction with microtubules to measure microtubule-stimulated BimC ATPase activity. The ATPase activity can be measured with an endpoint or kinetic assay. Other uses of this motor protein include identification/characterization of proteins or small molecules that affect motor ATPase activity and identification/characterization of proteins or small molecules that affect motor/microtubule interactions.